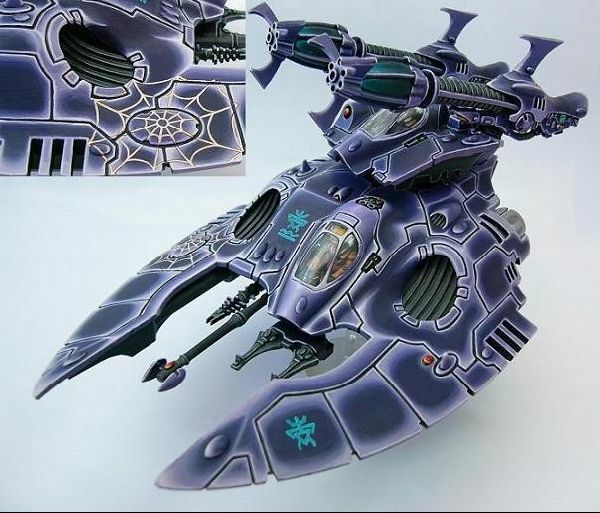 I'd really love to see an entire army painted in this scheme! The colors are perfectly blended and the model is very neatly painted, excellent! Wow stunning work. The color fading is awesome, the model is great, and color/design are very cool and unique. Love it. geez, that's awesome! especially the glowing-effect in the night spinner barrels! the spider web emphasizes the theme of this tank very well, though it is kinda "un-eldarish"... nevermeind, more than a great model! Geez! That looks like a lot of work! I like the use of a monochrome colour scheme.